It was late in September 2011 and we were once again in the hospital with wild man. By this point I believe we had been in every room on the pediatric floor and we knew most of the nurses by their first names. He had been well enough to do a few visits with his birth mom by now so I knew what she looked like. Imagine my surprise when I see her going into the room directly across for ours at the hospital. I quickly got up and closed our door and paged the nurse. When I asked who was in the room across from us I got the standard “I can’t tell you that” answer. So I called our worker and explained what was taking place outside our room. Within a few minutes they had removed wild man’s last name for the front of the door, it is not a common last name so it would be noticed if anyone looked. I soon discovered that wild man’s half sister, who was about 1 1/2 years old, was in that room. I was in shock. I had heard he had an older sister but never dreamed I would see her. The next few days went by with the little girls birth dad only showing up at meal times. At first I thought he had come to feed her but quickly realized he was coming in to eat what was on her tray and then he would leave. The mom was only there that one night, we never saw her back in the hospital. I think God allowed me to see her so I could make the connection between the two babies. She cried. Day in day out she cried. No one there to hold her. No one there to comfort her. No one there to love her. I wanted to hold her, comfort her, but could not. I cried for her. The day came we were cleared for discharge. While we waited things in the room across the hallway got heated. The dad was screaming saying he was taking his daughter and there was nothing they could do about it. Our nurse closed our door but you could still hear him yelling and the little girl…crying. After we got home I could not help but worry about her. Then two days later our phone rings. It was a call for her. The on call worker asked if I had her half brother to which I replied yes. We agreed to take her in. I had her in my arms less than 4 hours later. She had been in the hospital with upper respiratory issues and while in the ER roaches had crawled out of her ear. You dont have to read that again I did say roaches in her ear. I am only guessing that’s why there was a follow up at the house. After being checked out at she was brought to us. She was filthy. Her hair was brown, so we thought, until I gave her a bath that revealed she in fact has blonde hair. She was 16 months old and could not sit up by herself let along walk. She did not talk and did not know how to eat from a spoon. How could you do this to a child? She quickly became part of our family. And for the two and a half years that followed we dealt with the court hearings, visits with birth parents, yes after all that they received visits, and we dealt with the problems that come getting a child that’s a little older. We had a wonderful group of Birth to 3 workers that got her to hit all of her milestones she had missed while younger. She was doing great considering all she had been through. By God’s grace she and wild man became part of our forever family on the same day. It was one of the happiest days of my life. She is now 6 going on 25 lol. She is all divia all the time. We still deal with many things from her past. Don’t let anyone ever tell you “Oh she/he is to young to remember what happened” They do remember to some extent. The memories may not come up daliy but there is always something there and you never know what will open up the part of their past. We have problems daily with lies and her only wanting to listen to her dad (males) and countless other things that most people will never understand. Being 6 is difficult for anyone. I am not going to kid myself being her mom has been the most challenging thing I have ever done, but I would not change it. Children who have been through hell and back need to know they have someone in their corner, even if they don’t want you to be. I have heard more times than I can count that she hated me, that she hates our rules but then there are the good days where we laugh and paint our nails, fix our hair and do each other’s makeup. The good days are what it’s all about. The good days are why we became foster to adopt parents. The good days is what we will remember. Good always wins over the bad. Together we will overcome all the terrible things that have happened. We will survive this together just as God had planned. From our beautiful chaos to yours enjoy your day. Have you ever looked in the mirror and just wanted to turn away? I know I have. What is beauty anyway? Well I can tell you its not what the TV or magazine models want you to beleive it is. And it’s not about staying a size 2, wishing you could eat a doughnut. It’s not about fablous make-up, or great hair days. It’s not about the perfect selfie that took 20 mins to take. It’s not about the latest clothes or the biggest diamond ring. No, being beautiful has nothing to do with any of this things. Beauty comes from within one’s self. Beauty is being able to laugh at yourself. It’s about stepping into those new size 10 jeans and owning it. Its about messy hair days and your husband still thinking you are the most gorgeous woman on the planet. It’s allowing your kids to do your makeup. Beauty is food glorious food. It’s a smile from across the room or in a hug from an old friend. It’s forehead kisses and late night snuggles. It’s in a person’s eyes and the way they see the world. Beauty is in the words we say to each other and the way we act toward each other. Beauty is the way your children see you even on your not so great mom days. We are all beautiful. We come in different sizes, genders, and races but we are all beautiful. Don’t let anyone tell you different. God made us perfect in His imagine that means you are a child of the King and He does not make mistakes. You are perfect just as you are. Remember that. It does not matter if your hair is turning gray or if it has fallen out. It does not matter if you have gained 5 pounds or 50 pounds you are a beautiful you. Love yourself embrace the you God has made. Thank you dear friend for reminding me that I am beautiful even on my worst days. Your words this weekend inspired me to let my beauty be part of very thing I do. From our beautiful chaos to yours, enjoy the day and embrace the beautiful you. Author beautifulchaosmommaPosted on July 18, 2016 Categories foster parent lifeLeave a comment on How do you define beauty? As we celebrate our son’s third birthday today I can’t help but remember how he came to be. Todd and I were on our way to Walmart one Saturday early in July when our lawyers office called to give us our adoption date for JR and Elissa’s. Finally we knew for sure they would be ours and that September date could not come soon enough. As we drove and discussed plans for an adoption party and we also talked about our future as foster parents. JR and Elissa’s journey to be forever ours had taken over two and a half years and I didn’t know if we had it in us to do that again. We agreed that after the adoption we were done. Our hearts had been broken time after time and we felt this adoption was where we were to stop. That was our plan…..not God’s plan. That Wednesday night while Todd was at church we received a call about a baby boy in the hospital. My heart wanted to say yes but I said no, after all we had just had this discussion a few days ago and I was not going against what we had decided. I got off the phone and instantly began to cry. I am not sure why. Earlier that day I had turned down a group of 4 siblings and up to that point in the year we had to turn away over 152 different placements because we simply did not have room(many where sibling groups). Each time I said no, I got off the phone prayed to God the child (ren) would be placed in a good home and went on about my day. Why was THIS call different? By the time Todd made it home from church I was a mess. He took one look at me and said “Whats wrong?” I explained to him we had received a placement call for a baby boy and that I turned it down because we had said we were done but that I could not shake the guilty feeling for saying no. He looks at me and says call the worker back, he belongs here. I look at the clock and it’s 1030 at night, way to late to call back. Besides it’s a younger children I was sure he was placed safely by now. I would wait until the next morning before calling. With that I had done all I could. Thursday closed with no word from the worker. I went to bed knowing we had done all we could and knowing he was probable safe in a loving home somewhere else…..sorry papaw. Friday afternoon my phone rings. The lady on the other end said, “Hey this is Mrs X with DHHR are you still open to take in the little guy?” My jaw hit the floor. After some small talk she told me she would be at my house and explain the situation in person instead of over the phone. I could not wait to see the little guy. I was expecting a 6 to 8 month old, what we got was a 3 day old newborn. Talk about shocked. The worker told me that he was birth moms six or seventh child. He was suppose to go to an Adoptive family after he was born. The “Adopting couple” showed up to the hospital took one look at him and said he was to “black” and decided he was not for their home. For the recorded his birth mom is biracial so that makes him biracial. Seriously?? He is a precious child what does skin color have to do with anything? They had called me after that. God works fast. He was beautiful. He was born with Marijuana in his system (which we dealt with) but other than that he was a perfect newborn. He would stay with us until they could find him another home. That never happened, he was destined to be ours. The rest is history. Today we celebrate his 3rd birthday. God knew He was ours from his first day. Out of all the people they could have called they called us. What are the chances they would not find a home for a newborn after they called us? What are the chances I would call back and say yes the next day? There are no chances only God’s plan. Thank you Jesus for making us part of Alex’s life. Happy birthday baby boy you are loved more than you will ever know. And to my Papaw thank you for coming to me in my dream that night three years ago. Continue to watch over Alex and the rest of us. I wish you could have met them all in person. I hope I am making you proud. Love and miss you greatly. Come visit me in my dreams anytime. As kids come and go out of our home we have given them all nicknames in order to protect their privacy. Through out this blog and blogs to come I will refer to them with their nicknames to continue to protect them. Jump forward a few months after our first little man removed so he could be with his siblings and we are now the foster parents to two beautiful little girls, one turning 1 and one just a few months old. I will share a small portion of their story with you. I received a call about the girls, of course I said yes, and was told I would get the baby first while the older one was in the hospital. The worker brings us a very tiny and sickly baby girl who was small enough to fit in the palm of my hands. For the next few days we bonded with her,loved her and watched life slowly came back into her eyes. It came time to go pick up the oldest sister and I was taking into a room to watch a video about how to care for her head injury. The nursed warned me that she had not moved much or made any type of eye contact with anyone since her surgery. I slowly walk to her hospital door scared of what I was going to see and questioning myself on if we could really handle this situation. Then I opened her door and as if she knew exactly who I was she jumped up and smiled. She began reaching for me and babbling. The nurses looked puzzled and asked if I knew her. I replied no, I did not know her or her family I just said yes when Dhhr called. I picked her up and as if she knew she was safe she hugged me and fell asleep on my shoulder as I signed discharge papers. The next few weeks were filled with doctor appointments, birth to three appointments, and even a sign language specialist, we were told both girls were deaf. Life was moving fast but we loved it. They quickly became part of our family. If we did something they were with us. Church, vacations, trips to grandma and grandpa’s it did not matter we were now a family of 6 and we could not be happier. The legal side of the system was moving along as well. Visits with the birth parents stopped we were told they would be moving towards termination of parental rights. After that they would be placed up for adoption. Since they had been with us longer than the 6 month bonding law things looked great(at this point they had been with us 8 months). Soon they would be forever ours. We could relax. My husband and I decided to take a weekend get away just the two of us. We made the necessary arrangements and off on the motorcycle we went. We were enjoying our long weekend when my cell phone rang. It was the on-call worker. She had a little boy almost 2 months old that needed placement just for the weekend until the grandmother could get things in order. I told her to let me ask Todd and I would call her right back. I turned around and there I find my wonderful husband packing our bags, he over heard the conversation and was already getting ready to head home. I called her back and told her we would be home in about 5 hours. The GAL (the girls lawyer), the caseworker and adoption worker scheduled a meeting at our house. We thought it was to finalize that we indeed want them to be forever ours. That was not the case. An aunt and uncle out of state had been located and as long as their home study checked out the girls would be placed with them. We were crushed. We did all we could, we went to court had a hearing, met with the a panel of people on the case pleaded through pictures, testimony, and tears for them to allow the girls to stay with us. They were our girls now how could this happen? While we waited for the decision to be made visits with the aunt and uncle were set up. We met them and I wanted to hate them, after all they were trying to steal our girls, but I didn’t hate them. Their family was so similar to ours. They were every involved at their church, they also had older kids, football on Friday nights and when I handed over “Miss Fannie” to the aunt she cried just as I had done. They were still in shock. They did not know anything about the girls in fact that did not even know they existed until the worker called them. They too had dropped everything they were doing and headed to met the girls. I really wanted to be angry, but they were sweet genuine people who where just as confused and scared as we were. All of our lives were about to change forever. Our court date arrived and we headed to the courthouse praying for God’s will to be done but hoping it was for the girls to stay with us. We get off the elevator to see the lawyer talking with the aunt and uncle, the hearing had been moved up and we had not been notified. The lawyer looks at me and says, the girls will be going home with Mr and Mrs X today. Please go home and pack their stuff and be at the office in an hour. Tears rolled down our faces as we turned to get on the elevator. 9 months and it was over like that. We hurried home, quickly packed their things while our older kids told them goodbye. We loaded then up called grandma’s and grandpa’s to tell them the girls were leaving us and that no we didn’t have time to let them sat goodbye. We pulled in the office and their the lawyer and the aunt and uncle were waiting. I held back tears as we loaded their things into the van, kissed them both ever so softly on the top of their heads and told them I would forever love them as I prayed. That’s when their daughter came up to me and handed me a letter she had wrote. In it she thanked me for loving the girls and keeping them safe. She was maybe 7 or 8. I hugged her and told her she was going to be a great big sister and thanked her for being so kind. We drove off while they continued getting things in the van. I have never cried so hard. How were we to continue? Why did this happen again? Why was God doing this to us. We walk through the door and I find our wild man sleeping peacefully thanks to my in laws, they watched him while we took the girls down the road. I vowed then that after he returned to his grandmother(a month in and still working on getting things worked out) We were done. My heart could not take it anymore. The years have passed and I am pleased to say I still get to see “our Miss Sweetie and Miss Fannie” thanks to social media. They are beautiful and talented and have grown much. They have a wonderful family that loves them and I see they are where they belong. Yes I miss them daily but I know now God had a plan for them. I am thankful their forever mom aka their aunt and I have become friends and she let’s me see them through the power of technology. I still have the letter their daughter wrote us tucked away with some photos and things from our time with them. And who knows maybe one day I will get to see them again face to face, but for now I am blessed that we had them for the time that God needed us to watch over them. I am blessed we got to feed them and help them become healthy, we got to love them when they needed love the most. We got to be part of their beautiful story because God saw fit for us to be there at the moment in time. From our beautiful chaos to yours enjoy your day! My kids are playing on the swing set and having a water balloon fight and all I can do is smile. Well that’s a lie. I also find myself thinking about the little ones that are not here. I have wondered many times why so many foster children have came into our home only to be forever placed somewhere else. With every departure a piece of my heart goes with them and I question why did he/she not get to stay? Our first placement was no exception. Our first little boy as only with us for three short weeks, but I was in love the moment I saw him. When the on call worker called and asked of we could take the placement I quickly said yes. We were told it would take months before we got our first call. But here it was two weeks after we finished our classes, we had not even received our certificates in the mail to offically say we were approved. The worker said it would take a few hours to get things ready so that gave me time to go pick up a baby bed and a few must haves (diapers, bottles, a few outfits, and some baby wipes) The workers came to our home and in somewhat like a business transaction he was placed in my arms with a list of things that needed to be done within the next 72 hours, I was asked if I could handle it and then they were gone. I called my husband and told him, “its a boy” and took our new addition with me to pick up our kids from school. Needless to say everyone was excited. The next few days were full of doctor appointments and holiday celebrations. Life was good. As many do with their first placement we were already picking out his new name and thinking of ways to decorate his forever bedroom. Then one day mid December my phone rings. The worker called to tell me that there had been a court hearing and that “our boy” Would be going to live with his siblings in another foster family. I was crushed. She ended our conversation with “I am sorry but I will be there in an hour” And hour? That’s all the time I had to get him ready, to say goodbye, and to calm myself down before she came in. I carried him to the car, kissed his forehead, said a little prayer and just like that he was gone. Just as fast as he had come into our lives he was gone. My husband and kids did not even get to say goodbye. I cried the whole evening, I questioned God’s plan, I said I would never do this again, and then I prayed. Why would God bring this beautiful baby boy into my life and then take him away? I still don’t know the answer but I am thankful for the time we shared. A few days passed and I called my homefinder to let her know we could be placed back on the Call List. After all we had not spent months in training to give up that early and we knew the need was still there. I still wonder about our 1st little guy. I am sure he is enjoying life with his brothers and his new family. I am hopeful he is loving life just as God planned. I am also sure he will never remember his few short weeks with us and the love he had for him, but that’s OK because I will always remember. We have a his picture, along with all of our foster babies, hanging on a wall in our piano room. Every time I pass those photos I can’t help but smile. Even though most of them no longer live with us they will always be our kids. Each one holds a place in my heart. As I watch my five little ones, now playing in their playhouse, I am thankful God saw fit to let me be their forever mom. I may never understand why He chose to let these five stay but I am thankful everyday He did. God is good all the time. The thing about foster care is you never know how long each child will stay. It could be a week, a month, a year, or two years, or forever we just don’t know. But while they are with us It is our job to love them, protect them, hold them, kiss them, and let them know what a family is like. It’s that simple. While they are here they will be MY CHILDREN to the fullest meaning of the phrase. And if they leave our home I will forever be their Momma C. Placement after placement the heart only grows stronger. After going through a nasty divorce I decided to go back to college and make something of myself. As a young child I dreamed, as many do, of growing up and changing the world for the better. I always thought I would become a teacher or a nurse to make those dreams a reality, but life happened and I ended up getting married shortly out of high school and had a baby. The divorce was my second chance to make my childhood dreams come true. I decided nursing and teaching were not for me but becoming a social worker was my destiny. I started my online classes and ended up finishing my associates right before Todd and I got married. After our wedding I started thinking about going back to college for my bachelor’s degree. That’s when God intervened. One night God spoke to me. His voice was as clear as day. I still get chills thinking about that one sided conversation. I jumped up and told Todd that I felt God was telling me ” Now that you know what these children go through, I want you to house them, love them, protect them,and you will be rewarded with My blessing.” The logical side of me was thinking there is no way. God knows we can’t do this. I had loans to pay off and if I wanted to further my education I had to go to work so we could afford it. But I knew God wanted us to follow Him, that’s how faith works. Sometimes God takes us out of our comfort zone that way we rely on Him and only Him. So without questioning my sanity, Todd took my hand and said “Let’s do this.” The next morning we had a family meeting and asked Sierra and Devin what they thought about us becoming a foster family. They of course loved the idea. 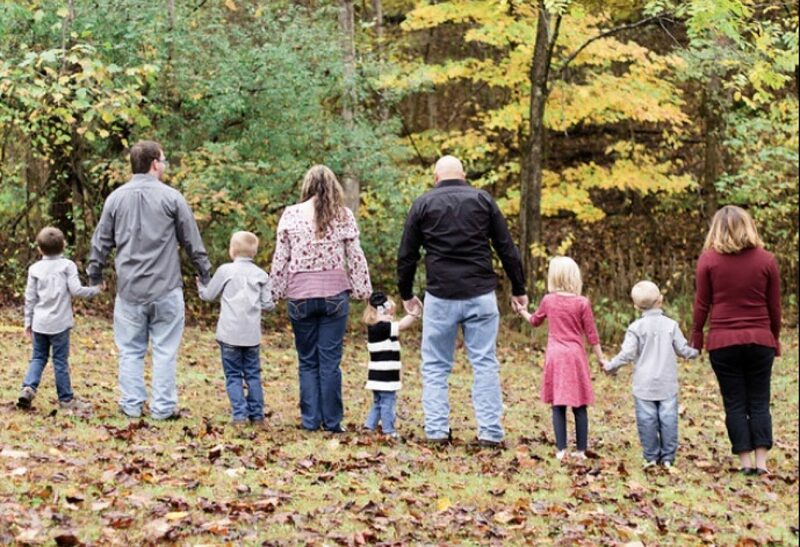 So as a family we made the decision to step out in faith and become a foster family. The next morning I started researching how to become a foster family. I ended up calling the local DHHR and was directed to a home finding specialist who told me, “As luck would have it we started a new PRIDE class last Saturday and had a few couples not show up. If you would like I can add you to that class?” Luck had nothing to do with it, God had a plan and He was making sure it happened. Just like that we signed up and attended our first class that weekend. That one phone call changed our lives forever. I will end there today. Check back tomorrow.